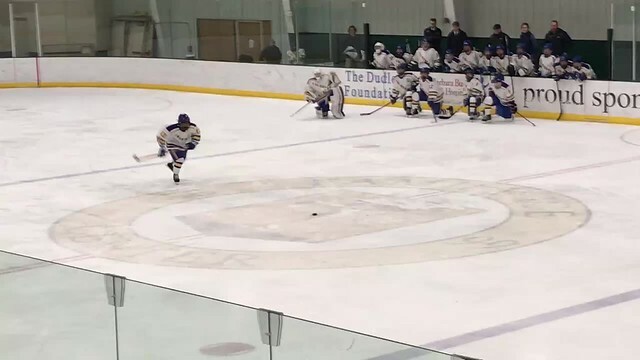 The Ultras took over Falmouth’s home arena and the Clippers finally gave Charles Henry Watson ’22 some offensive support. The result was an exciting 3-2 win for Yarmouth. The Clippers will face their toughest week of the season as they host Leavitt on Monday night at 5:30 pm and Cheverus on Wednesday afternoon at 4:50 pm. The Clippers will then hit the road to take on Scarborough at USM on Saturday at 8:00 pm. Yarmouth came out soft in the first period and Falmouth dominated play in the Clippers’ zone. However, it was not until 2:52 left in the first period that the Yachtsmen were able to beat Watson. Despite being outshot 12-6, Watson’s strong play keep the deficit to one goal. In the second period, the Clippers finally played with some grit and began get pressure on the Falmouth netminder. 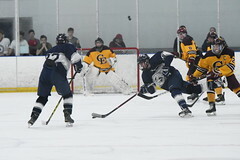 However, Falmouth extended its to two goals when Garrett Tracy blasted a slap shot from inside the top of the circle. 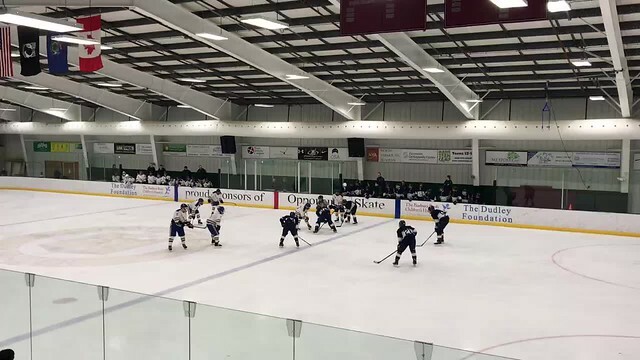 With 15 seconds left in the second period, Matt Sanborn ’19 scored a timely goal with a perfect backhand shot through traffic into the top, left corner. Matt Robichaud and Michael Guertler picked up the assists, but Aidan Miller’s net-front presence was also a major factor. Sanborn’s goal cut the lead in half and the score was 2-1 after two periods. In the third period, the Clippers played progressively better and finally got pucks and bodies to Falmouth’s net. 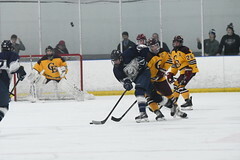 At 9:20 in the third period, Will Giese ’20 capped a nice rush with a strong drive to the net for the game-tying goal. Defensemen Matt Robichaud and Cameron Miller ’22 registered the assists. Giese beats the Falmouth defender to the oustide . . .
Sanborn and Giese’s tallies seemed to energize the Clippers and with 5:32 remaining in the game. Aidan Miller ’20 scored what would be the game-winner from Will Giese. 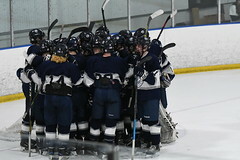 Suddenly, Yarmouth found itself in control of the game with three unanswered tallies. Late in the game, Sam Marjerison ’19 hauled down Dipesh Cyr-Brophy on a breakaway and a penalty shot was awarded. However, Watson was up to the task and preserved Yarmouth’s lead. To keep the game interesting, the Clippers picked up a late penalty and were short-handed in the final two minutes of the game, but again, Watson was solid and pulled out the win. Liam Ireland ’20 is deserving of the Lester Patrick Award for suiting up as the backup goaltender on short notice.